Marvel launched Avengers Assemble as a movie tie-in in only the loosest of terms. The initial storyline, by Brian Michael Bendis, featured the film’s cast as they fought Thanos and teamed up with the Guardians of the Galaxy (the next non-sequel Marvel Studios film). It would have been easy to just get rid of Assemble once that story was finished, but the reshuffling of the Avengers franchise thanks to Marvel NOW! meant that a niche had opened up. I think there’s room for a lighter Avengers title amongst all the heavy space drama, which is where Avengers Assemble: Science Bros comes in. Kelly Sue DeConnick worked with Brian Michael Bendis on Castle: Richard Castle’s ‘Deadly Storm’ and is close friends with him, so she’s able to keep a similar tone to his while maintaining her own voice. 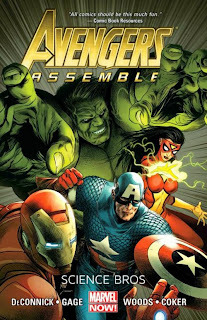 The issues collected here take place just before and during the transition into the current Avengers franchise, and they help smooth out some of the elements glossed over by Jonathan Hickman’s Avengers World. This also makes it one of the last books to feature Peter Parker as Spider-Man (at least before he returns in whatever will come after Superior Spider-Man), and I do wish DeConnick had done more with him. As it stands, his appearances in the first story arc are highlights of the book. As I mentioned in my Avengers World review, the one character who needed some alterations to fit back into the team was the Hulk, and Assemble, along with Indestructible Hulk, provides the necessary changes. The title of the trade and the first story arc refers to Bruce Banner and Tony Stark, whom the fandom dubbed the “Science Bros” after their chemistry in the Avengers film. It was a brilliant take on the characters and Marvel was wise to follow through with it in the comics. DeConnick sets them up in opposition, with Stark as the perpetual optimist and Banner as the understandable pessimist. Despite their conflicting ideologies, they’re able to solve the convoluted problems the Avengers keep finding themselves in; a good chunk of Infinity involves their teamwork. It also feels like a natural progression of their characters to some degree, although considering Planet Hulk and World War Hulk, I have to assume that some counseling sessions took place off-panel. The first story involves a bet between Stark and Banner as to who can find a missing mutual friend in an Antarctic base. With Thor and Spider-Woman along as their respective teammates, it becomes a fun jaunt until, in horror movie fashion, the pile of corpses is found. DeConnick nails the switch in the mood between issues nine and ten, allowing just enough humor without making the characters seem like sociopaths. They soon discover that the missing scientist is working with a Chinese madman, Yun Guang Han, to re-seed Earth with microbes found in an ancient lake and take it over. Han is a villain who needs to return: not only is he wonderfully smug, we also never learn the cause of his horrific mutation. The High Evolutionary recently returned in Avengers, and Han would make a good assistant/foil for him. From there, we go to a two-parter starring Black Widow, Hawkeye, and Spider-Woman, the newest Avengers love triangle. I don’t necessarily buy Hawkeye and Spider-Woman dating ... but as indicated here and in Hawkeye, not even they seem to know if their relationship is serious. The mission revolves around a favor the Black Widow offered to the wife of one of her victims. What proceeds is a rather odd story featuring a body-altering drug and lizard-people who look like Doctor Who’s Silurians. The plot eventually takes a back-seat to some excellent character work, and by the end, there’s a sense that Assemble is really about the female Avengers and their perspective on the Marvel universe. There’s even an appearance by Lucky the pizza dog at the end. The included Annual doesn’t fit into the “female perspective theme,” but then it doesn’t fit with the book’s tone, either. It centers on the Vision, who came back ... at some point. I think it was during or right after Fear Itself; I didn’t really notice that the current Vision isn’t the “Young Vision” who was a member of the Mighty Avengers. The Vision is part of the greatest Avengers love triangle, which has unfortunately been screwed up beyond repair ever since House of M. While the Annual is intended to set up a new status quo, it doesn’t really resolve anything for Vizh, since Age of Ultron put a spanner in the works for him until the launch of Avengers A.I.. The better character in the Annual is Sunturion, a classic Iron Man foe who does what everyone in the Marvel universe wants to do and starts burning down the corrupt corporate juggernaut Roxxon. Sunturion was always one of the more honorable bad guys and the story ends with some hope for his redemption. Unfortunately, the story isn’t helped by almost half a dozen artists working on it. All of them are good, including Mike Deodato, Luke Ross, and Mike Mayhew, but it ends up looking jumbled. Stefano Casselli on the first arc and Pete Woods on the second are as solid as always. Like Avenging Spider-Man, Avengers Assemble is the go-to book when extra issues are needed for another story. After this trade, two issues are Age of Ultron tie-ins, while the next two are part of the Captain Marvel “The Enemy Within” crossover. There probably won’t be another Assemble trade for a while, but it’ll be worth it, as Warren Ellis is co-writing with DeConnick after the Infinity tie-ins end. If you’re a fan of the female Avengers and/or the Hulk and Iron Man, I’d check out Avengers Assemble: Science Bros. It’s not crucial, but it provides a different perspective on the more earth-shaking events going on in Hickman’s books.